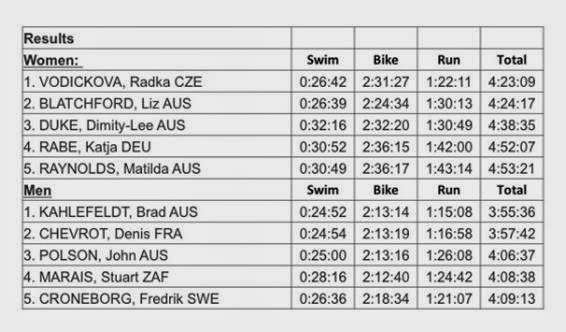 Brad Kahlefeldt (AUS) led out of the swim in the men’s professional race and was pipped out of transition by Denis Chevrot (FRA). John Polson followed two minutes later and the three athletes controlled the front of the race all day. Coming into last transition Kahlefeldt was first in and out followed by Chevrot and Polson. It was then a case of running blind for Kahlefeldt as he was unaware of what was happening behind. Sweden’s Frederik Croneborg has completed every IRONMAN 70.3 race in Asia and was glowing of the race and the course after crossing the line in fifth place today. Radka Vodickova (CZE) took her first IRONMAN 70.3 win today here in Putrajaya in sizzling conditions. The Czech athlete who likens Malaysia to being a second home said at the press conference on Saturday that she hoped she would not let anyone down. She kept her promise.